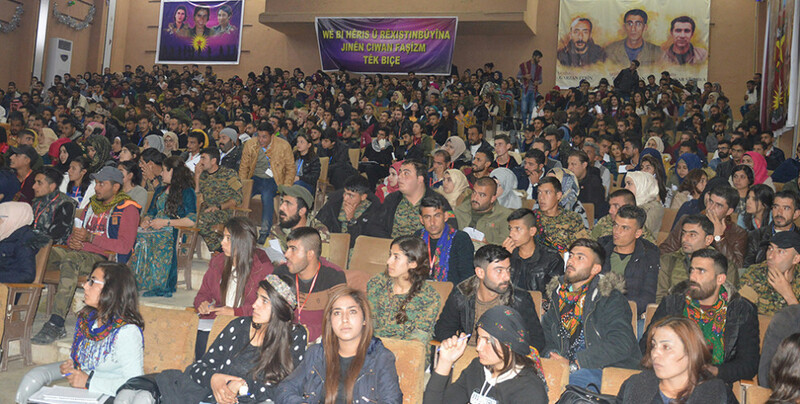 Second congress of Rojava Youth’s Union (YCR) continues in its second day with the participation of 5 thousand young people. The congress is taking place at Aram Tigran Culture and Arts Center in Rimêlan district of Girkê Legê. The slogan of the Congress is: “Let’s build a Free Syria with the Revolutionary Youth’s Struggle”. Five thousand young people from Northern and Eastern Syria are attending the congress. On the first day members and guests from the Syrian Future Party, Syrian Democratic Council (MSD), Syrian Democratic Forces (SDF), Northern and Eastern Syria civil institutions also attended together with young people from North, South and Eastern Kurdistan. The discussions of the first day focused mainly on the role of the youth. The congress continues today with discussions about the problems faced by the young people and their situation.